This range of non-alloyed mild steels is designed for deep and extra deep drawing applications. These products are used extensively in the automotive industry, both for visible and structural parts. The guaranteed low scatter in their mechanical properties ensures optimum productivity in drawing press operations. These ArcelorMittal steel grades are non-ageing, conserving their mechanical properties and their formability over time. They are also suitable for class 1 hot dip galvanizing according to the EN 36503 standard. The ArcelorMittal range offers better guarantees than the usual standard-compliant drawing steels, while remaining compatible with standards. Steels in the HSLA (High Strength Low Alloy) range are hardened by a combination of precipitation and grain size refining, resulting in high strength with low alloy content. This enhances weldability and choice of coatings, since these steels exhibit neither weld zone softening nor grain coarsening. These grades are particularly suitable for structural components such as suspension systems and chassis and reinforcement parts. For their respective yield strength levels, these steels all exhibit excellent cold forming. The entire range of HSLA steels offers good fatigue strength (suspension arm, shock tower) and impact strength (longitudinal beams, cross members, reinforcements, etc.). Because of their mechanical strength, the weight of reinforcement and structural components can be reduced. The HSLA range of products is available cold rolled grades. The various grades are identified by their yield strength. Hot rolled HSLA grades can be given a Class 1 hot-dip galvanized coating according to the EN 36503 standard (post-galvanizing). These steels were designed to provide an excellent combination of drawability and mechanical strength based on their specific interstitial free (IF) metallurgy. IF180 offers drawability similar to that of ArcelorMittal 04 combined with tensile strength comparable to that of H220, for example. These steels are hardened by adding manganese, silicon and phosphorous in solid solution to the ferrite. The metallurgy of IF steels optimizes their drawability. Their low YS/UTS ratio and high strain hardening coefficient n ensure excellent deep-drawability and good strain redistribution. Their high strain ratio r ensures good deformation behavior, making them suitable for deep-drawing. These steels are particularly suitable for complex parts requiring high mechanical strength, such as wheel arches, toe-boards, reinforcements, etc. These steels have high strain hardening potential during forming, lending deep-drawn parts (trunks, tailgates, doors, linings, wheel arches, etc.) good dent resistance. The IF180 to IF 260 grades can be used, with certain coatings, to manufacture visible parts such as door panels. The IF 300 grade is designed for more complex structural parts (longitudinal beams, cross members, suspension and chassis components, etc.). The composition and processing of these steels are designed to promote a significant increase in yield strength during low-temperature heat treatment, particularly paint curing. Substantial weight reduction potential at equivalent dent resistance (the decrease in thickness is offset by increased yield strength resulting from the heat treatment process). Bake hardening steels thus offer a suitable response to automotive bodywork requirements. By providing an excellent drawability-dent resistance combination, they enhance vehicle weight reduction and aesthetics. Dual Phase steels offer an outstanding combination of strength and drawability as a result of their microstructure, in which a hard martensitic or bainitic phase is dispersed in a soft ferritic matrix. These steels have high strain hardenability. This gives them good strain redistribution capacity and thus drawability as well as finished part mechanical properties, including yield strength, that are far superior to those of the initial blank. The yield strength of Dual Phase steels is further increased by the paint baking (also called Bake Hardening, BH) process. The following table shows the availability of the various steel grade families from VAMA production lines. X stands for unexposed surface finish, and Z for best surface finish for exposed parts. USIBOR® 1500P: Usibor® 1500P is a hot formed grade intended for use in automobile structural and safety components. The very high mechanical strength of the final part makes it possible to achieve weight savings of 30% to 50% compared to conventional cold forming grades. Exceptional fatigue strength (Usibor® 1500P) and impact resistance, allowing substantial weight reduction. 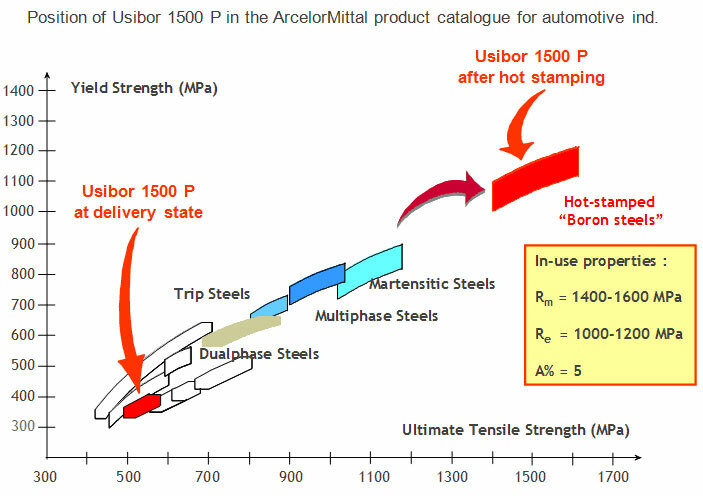 ArcelorMittal was the first steelmaker to deliver a coated press hardened steel, Usibor® 1500-AS with an aluminum-silicon coating. Excellent resistance to pitting corrosion, currently used in dry and wet areas (e.g. side sill) of the vehicle. Customer specific requirements upon consultation. Extragal®: Because of their high corrosion protection capacity and surface quality, Extragal® coated products are recommended for numerous automotive applications, for both visible and non-visible parts. 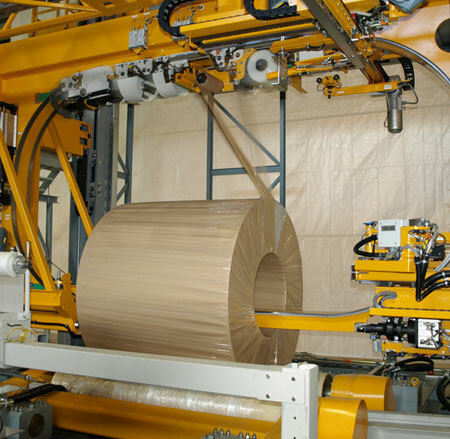 The Extragal® production process, involving a continuous single-step operation after rolling, makes it nearly always the most cost effective pre-coating solution for obtaining the corrosion resistance required in automotive sheet applications. Extragal® is a trademark of ArcelorMittal and has been licensed to VAMA. Galvannealed: The excellent corrosion protection and high surface quality offered by Galvannealed coatings make these products well suited for numerous automotive applications involving both visible and non-visible parts. The presence of iron in the coating improves resistance spot welding behavior, so that Galvannealed products are especially recommended when joining proves difficult with other coatings. Other steel grades or coatings not available from VAMA production assests can be provided from ArcelorMittal and Valin production lines through VAMA sales network organization. 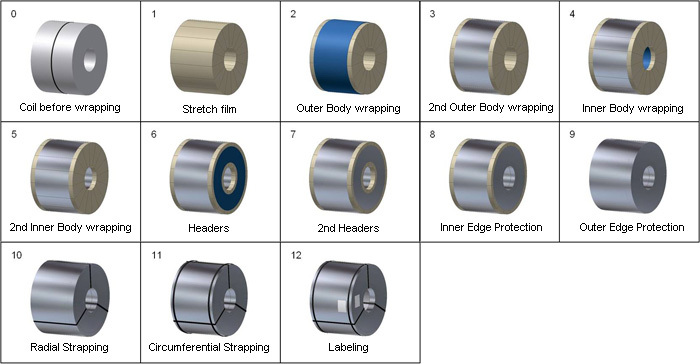 VAMA coil packing is designed to resist to corrosion, water ingress, condensation and mechanical impacts during transportation, such as to well protect the high value products until they arrive at our customer’s premise.